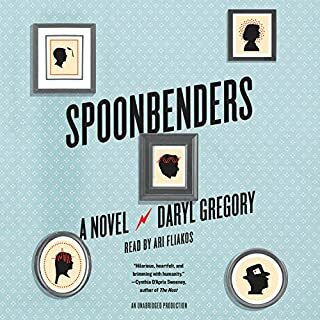 From award-winning author Daryl Gregory, whom Library Journal called "[a] bright new voice of the 21st century", comes a new breed of zombie novel - a surprisingly funny, vividly frightening, and ultimately deeply moving story of self-discovery and family love. In 1968, after the first zombie outbreak, Wanda Mayhall and her three young daughters discover the body of a teenage mother during a snowstorm. Wrapped in the woman's arms is a baby - stone-cold, not breathing, and without a pulse. But then his eyes open and look up at Wanda, and he begins to move.The family hides the child - whom they name Stony - rather than turn him over to authorities who would destroy him. Against all scientific reason, the undead boy begins to grow. For years, his adoptive mother and sisters manage to keep his existence a secret - until one terrifying night when Stony is forced to run, and he learns that he is not the only living dead boy left in the world. 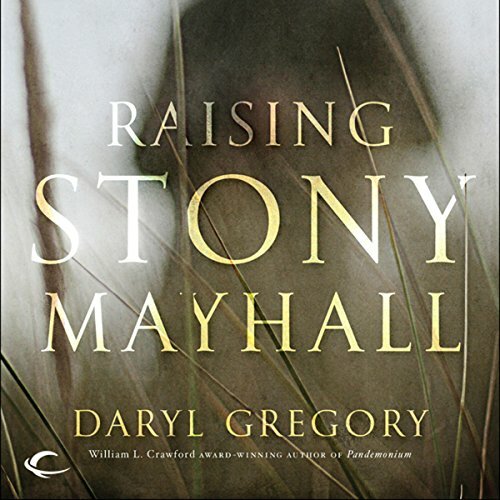 ©2011 Daryl Gregory (P)2011 Audible, Inc.
Daryl Gregory's Raising Stony Mayhall (2011) read by David Marantz is an absorbing audiobook: moving, humorous, and, amidst the legion of undead books and movies out there, original. In Part One, in 1968 on a snowy night in Easterly, Iowa, a zombie baby is found by the Mayhall family, mother Wanda and her three daughters. They must raise him in secrecy, because the boy, nicknamed Stony, is a "Living Dead" or "LD," and earlier in 1968 (the year of George Romero's "documentary" Night of the Living Dead) an outbreak of a mysterious disease that turned people undead hit the eastern USA. Though the contagion was seemingly stopped by the rapid and rabid reactions of civilians and authorities, if Stony were discovered he would be exterminated. The rest of the novel depicts his attempts to understand himself and the undead and living human condition. Gregory dryly revels in the ramifications of the zombie premise: an undead physiology by which LDs do not eat, sleep, breathe, bleed, heal, decay, or stink; an undead philosophy focused around the conundrums of life and death and of how the undead may make prosthetic wooden limbs move; a resistance LDA (Living Dead Army) working through cells and safe houses; an undead representative government comprised of factions like one that wants to spread the disease all over the world and one that wants to avoid violence no matter what; and so on. He also works out the personal ramifications for Stony. Is he human? Can he love? Does he have a soul? If so, where is it? In heaven, hell, or purgatory (because he is dead), or in his body (because he is alive)? For that matter, where is his conscious self? Confined to his bones and flesh, or limited only by his will and imagination? In addition to the possibilities of the zombie genre, Gregory is interested in the relationship between science and the supernatural. He also writes interesting and human characters (especially the undead ones). And he also wittily works in references to the popular culture of each of the eras through which his narrative moves, from 1968 until 2011. Reader David Marantz enhances the situations, conversations, emotions, and ideas of the novel with restraint, reading the different voices for the male and female, old and young, educated and ignorant, living and undead characters without exaggeration and with a twinkle in the eye of his voice. 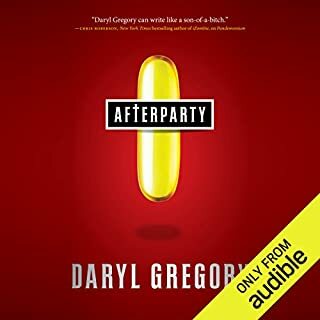 When you finish this entertaining audiobook, if you listen to the prologue again, more things will become clear and many touches will move you. Had a credit burning a hole in my pocket. This fit the bill perfectly. Thoroughly enjoyed listening to this odd little tale. would pick up more from this author in a heartbeat! The living dead seem to be rising just about everywhere you turn, and these days the zombie apocalypse is feeling a bit run of the mill. Do not let this keep you from checking out ?? ?Raising Stony Mayhall" - one of the most delightful zombie books I've heard. There?? ?s a trope in zombie fiction of a loved one being infected, and instead of being killed by family in friends, he?? ?s restrained and shackled. 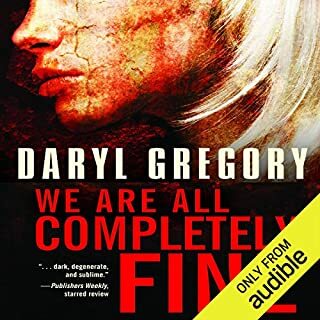 Almost always this ends badly, but author Daryl Gregory goes against the grain and starts off his tale in the late sixties, just after a Romero-esque zombie uprising, when a widow and her three daughters find a dead woman and baby in the snow. When the baby starts moving, they decide to take him in, and teach him about life, humanity, family, friendship, and sacrifice. Meet Stony Mayhall, and follow him as he impossibly grows up, and goes out into the world. You can tell Gregory had a blast writing ??? all the familiar zombie trappings are here, but turned on their heads. There?? ?s blood and guts and uprisings, sure, but there?? ?s also crazy zombie evangelicals and zombie hitmen, would-be superhero zombies, pulp writers and protesters, Deadtown, and so much more I?? ?d hate to give it away because it wouldn?? ?t be as funny when you hear it (and as well as being charming, this book is always very, very funny). In short, Stony does his best to try and keep things together, even while everything (including himself) is falling apart. This was David Marantz?? 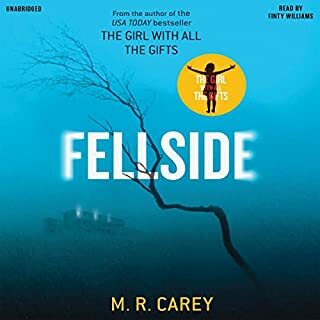 ?s debut as an audiobook reader, but he handles it like a veteran, breathing life (or whatever passes for it with zombie protagonists) into Stony, Delia, Mr. Blunt, Commander Calhoun ??? and made listening to this book a total delight. This is Gregory's third novel, and it leaves me wondering why his other two aren?? ?t out in audio already. I'm eager to see whatever he does next. I read EVERYTHING even while being a fantasy junky. This novel was surprising and moving and ....about ZOMBIES?! This is a reverse play for all previous tales of the genre. While the gore and excitement remain there are many surprises and even a 'feel-good' ending. I have to give extra kudo's for originality, otherwise I rarely give a 5-star. For myself, this was a satisfying escape and fully worth time and credit. I listened to "Raising Stony Mayhall" at the recommendation of a friend, although I was skeptical: sci-fi is not a genre to which I am usually drawn; certainly not zombies. I was pleasantly surprised. The characters, especially Stony himself, are wonderful. "Raising Stony Mayhall" is certainly a nerve-wracking tale of zombie wars and social upheaval, but it is also a tender and unexpectedly funny story of one man who is born different from all those around him and raised by those who decide that, in the end, love trumps all. As we follow Stony throughout his life, we watch him grapple with what it means to be different; to belong simultaneously to two groups but fully to neither. I never expected to laugh so much at a story that involved the undead. 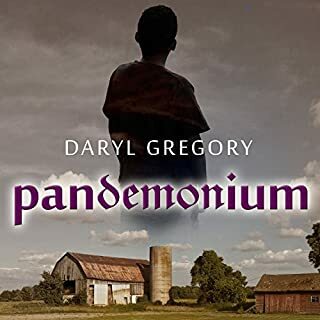 After I finished "Stony," I bought Daryl Gregory's previous books: "Pandemonium" and "The Devil's Alphabet," and devoured them both. Read "Raising Stony Mayhall"--you'll wish you lived as much as this undead boy. What a great story! I have really been into zombies lately, (don't ask). So, I have been reading everything I can get my hands on. So, I can safely say that "Raising Stony Mayhall" is one the best. I would recommend this book to anyone that likes a great read. Zombie lover or not. David Marantz is the narrator, and I have to say, he is perfect for this book. 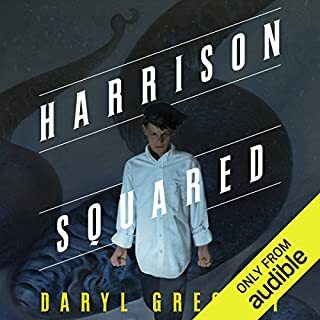 The producers at Audible Frontiers seem to really have a talent with finding wonderful books and then finding the perfect narrator for each production. Finally - a decent zombie story! I was hesitant to try another zombie or "walking dead" book - I've had bad luck with them in the past and swore them off after the last giant disappointment. I'm so glad I took a chance on Raising Stony Mayhall - it really is a great story with a new take on the whole undead genre. The book is not at all about zombies chomping on bodies and stumbling around moaning - or about desperate humans fighting off hordes of walking corpses with drama at every turn - it's about a real family with realistic characters dealing with the fact that one of them just happens to be not technically alive. The narration was easy to listen to - not flashy - just natural in a way that makes the narrator's presence barely noticeable - which I mean as a true compliment. The last quarter of the story went a bit off the map but it didn't turn me off enough to make me want to stop listening. Would I go for a sequel? Probably not - but I was very pleased with the selection overall and would recommend it as a fun listen for all. I thoroughly enjoyed this decidedly different zombie novel. The story was highly engaging, telling the tale of a world in which a zombie plague was unleashed but snuffed out years earlier. The remnant population of “LDs” (Living Dead, or “differently living”) has gone underground to avoid the reprisals of the intolerant dominant society of “breathers.” As the years stretch into decades and their undying bodies deteriorate from wear and tear that cannot be repaired, many of the LDs become philosophical, if not downright mystical, while others become increasingly militant. That there can be two philosophically opposed camps of zombies is made possible by slightly tweaking traditional zombie lore. In this world, those infected by a zombie bite only go crazy and eat humans for a febrile 24 hours. Once the fever is gone, they are no longer living, but neither are they dangerous. The protagonist, Stony, is of course a zombie but the circumstances of his arrival in this world are so unusual even other zombies find it hard to believe. He is different and wonders whether he will ever find another person who truly understands who and what he is. The book follows his life, first as he lives an Anne-Frank-like existence hidden by sympathetic “breathers” and then as he becomes a champion of what can only be called zombie civil rights. Because I think young adults are interested in these themes and also because Stony is a young adult for a good portion of the book, I think it can be classified as a young adult novel (not a bad thing). Lest you think the book is all heavy thoughts, there is plenty of zombie mayhem, guts and gore but there was an equal amount of character building, plenty of funny bits, and just enough sentimentality to make it fun and interesting. I listened to it as an audio book read by David Marantz, who did an excellent job narrating. What did you like best about Raising Stony Mayhall? What did you like least? I loved the idea of a zombie child and also of a story being told from a zombies point of view. I did not like how the story seemed to veer off, and I really started to not like the middle to end of the book. I wish I would have stopped listening after he became a teenager. Would you be willing to try another book from Daryl Gregory? Why or why not? Did Raising Stony Mayhall inspire you to do anything? Great idea... really loved the characters and the beginning of the book. Usually it is the opposite- I can't get into a book at the beginning, but like the end... Thisbook - I couldnt put down at first- I was listening at work, and before bed... Then, it hit a point where I was dreading listening to it. If you could sum up Raising Stony Mayhall in three words, what would they be? Have you listened to any of David Marantz’s other performances before? How does this one compare? I would have loved to sit and listen in one setting but between kids and college it was not possible. A lovely story where the zombie is the main character. I wasn't sure if I would enjoy this but Stony was such a marvellous character I was totally hooked and rooting for him. The end is truly astounding. A different take on the traditional zombie story. Kept me engrossed to the end. Not the best reader I have listened to but that did not make the experience less enjoyable.